Among the most crucial roles of the United States military in the global War on Terror is the collection of human intelligence from prisoners of war, unlawful combatants, and others. On the heels of controversy over some of the techniques used to extract informationsuch as waterboardingthe Department of the Army completely revised its interrogation guidelines. The result is this book, the United S… tates Army's human intelligence collection playbook, which gives instructions on the structure, planning and management of human intelligence operations, the debriefing of soldiers, and the analysis of known relationships and map data. The largest and most newsworthy section of the book details procedures for screening and interrogation, which permits a specific number of interrogation techniques, described in Chapter 8 as ';approach techniques.' These techniques, described in great detail, carry such names as Emotional Love, Mutt and Jeff, False Flag, and even Separation. 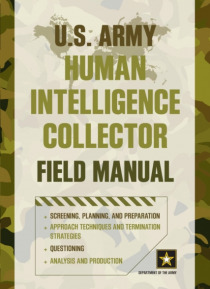 A must-read for today's military buffs, U.S. Army Human Intelligence Collector Field Manual is also a valuable resource for anyone seeking strategies to employ in the gathering of information.